1. Reading: This is a creation myth. A creation myth explains how different parts of the world and the creatures that live there came to be. Can you think of some other creation stories? (Greek myths; Book of Genesis; Native American myths; African myths). Try reading some of these stories. 2. Discussion: What other things, besides the creation of the world, does this story explain the origin of? 3. Science: The Sun – When it says “Sometimes you can see where Nob took a bite,” do you think it means when there is an eclipse? Look at pictures of eclipses to see what they look like. 4. Science: The Moon – Look at different phases of the moon. When does it look like it might have a “bite” taken out of it? 5. Science: Clouds – Look at pictures of cumulus clouds. Do any look like they might have a bite taken out of them? Do you ever look at the clouds and imagine they are different things? Try doing this on a day when there are good, cumulus clouds to look at. 6. Discussion: Why did everyone turn Nob away? How did Nob feel when everyone rejected her? What did she do about it? Have you ever felt rejected? What did you do about it? 7. Science: Try to find a spider’s egg in a web (indoors or out) and put it in a jar. 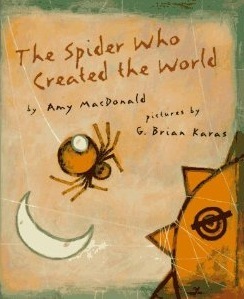 See if you can find out what kind of spider made the egg, and watch the baby spiders hatch out in the spring. 8. Science/Writing: Think of some important natural landmark near where you live-a big mountain, a lake, the ocean, a desert, a canyon. Can you think of a story to explain how it might have come to be?